42 meters high. Impossible to proceed inside. 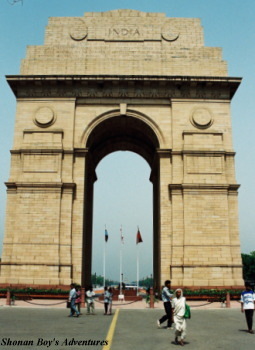 The monument of the World War 2, for 90 thousand Indian soildiers. 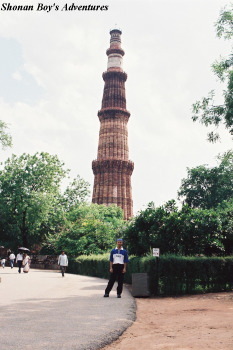 Diameter of 14.5 meters, 72.5 meters high. Previous height was 100 meters high, and it was shorter than before flight accident. 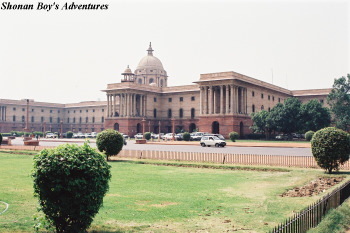 The first three storeys are made of red sandstone, the fourth and fifth of marble. 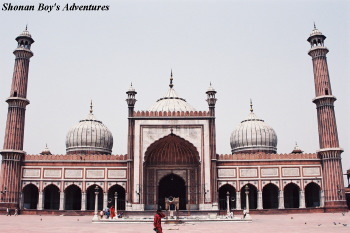 It was built by a Muslim King, Qutub-ud-din Aibak. "Raj" means king, and "Ghat" means cremation in English. This is the place where Mahatma Gandhi (Mohandas Karamchand, 1869〜1946) was cremated. "National Gandhi Museum" is located opposite Raj Ghat. He was assassinated on 30 January, 1948. And he was created the day next. 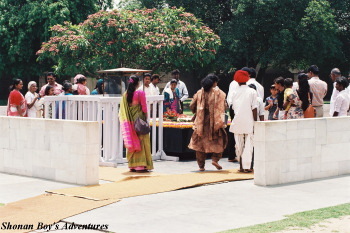 At Raj Ghat, flowers are continued to be offered by many people for Mahatma Gandhi, the father of India. Thanks to Mahatma Gandhi, India was independent. It was built by Shah Jahan, when he decided to shift his capital to New Delhi from Agra. And it was constructed from 1639 through 1648. 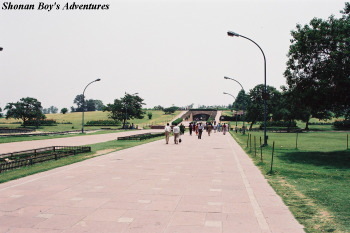 Lai Qila means Red Fort. 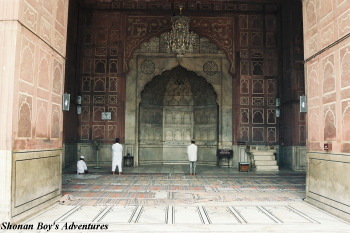 The Lahore gate is the main gate to the fort, getting its name from the fact that it faces Lahore. There is the "Moti Mahal" of pearl.。 I took this photo at Jama Masjid near Chandni Chowk. Muslim mosque, it was built by Shah Jahan. And completed in 1658 this Mosque has three gateways. When I went to India, I heard Indian tour guides who are not Muslim could not visit Muslim archtecures. So I visited Muslim archtectures without tour guide when I was in India. He was waiting for me outside. Once one war happened between British soildiers and Muslim soildier, and stone paved floor was coverd with their dead bodies here. Jama Masjid is located closed to Chandni Chowk, the street for Bazar. 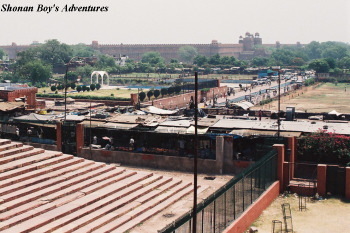 We went there by richshaw through Chandni Chowk, and visited Jama Masjid. 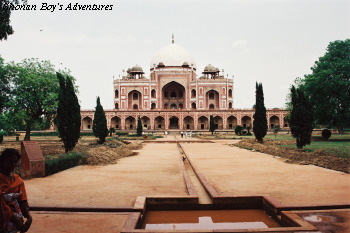 Humayun's wife Haji Begum built his Tomb nine years after his death, and completed in 1565. There were bugus guides at the gate. They wanted to make friends with foreign toursts. If tourists talk them, they say "You are very good person, etc... Let's write letters each other. Could you tell me your address?" If tourists let them know our address, they will send their sad lettters. The body is like this, "Our family is very poor. It is difficult for us to survive, and difficult to provide my children." As well they request us to send money to their account of bank. Please be careful!